In 1985, Jim Mellody dreamed up the idea of a family friendly restaurant, a neighborhood pub where friends and families could gather to enjoy good food and sports in a fun, comfortable atmosphere. 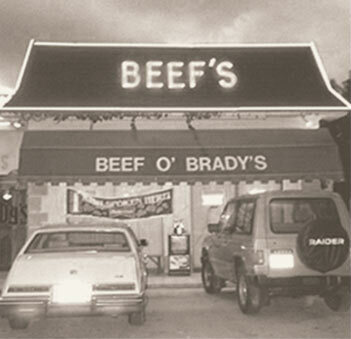 Together, with his wife Jeanette, they embellished the Brady family name and created the now-famous Beef 'O' Brady's®. Their first sports bar and grill opened in Brandon, Florida. The regulars quickly nicknamed it "Beef's®." Inspired by a love of sports, Jim filled his restaurant with TVs and satellite dishes so patrons could enjoy watching a vast array of sporting events. He also covered the walls with authentic sports memorabilia he had collected through the years. As a final touch, he made sure a traditional Irish Blessing graced every menu, bidding good fortune and happy times to all who visited. As the Beef's® story grew, so too did the menu. It was important to Jim that guests have variety (like the award-winning wings available in 12 signature sauces) as well as signature favorites with an Irish twist. Today, Beef 'O' Brady's® is one of the fastest growing kid friendly restaurants in the country. Some call it the "Luck of the Irish." Jim would call it a darn good dream that took a lot of hard work.